Home handyman. I got it from my dad. He was an farmer, before I was born. And you always had to do everything for yourself. I helped him, started early. basicly I never hired anyone to do anything for me. (Except a roof - I put an Aluminum one on the barn but for the house I flet someone else do it. I've hired a few day laborers to assist with some of the things. Added on rooms, rebuilt the kitchen, built the barn for horses, did the fencing. I enjoy doing those things. But at 66 it get a little more tiring and a little slower. Thanks great to be here. Thanks for being our Buddy Karson, & Good Luck. 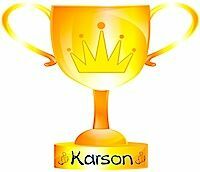 A big thank-you to you, Karson, for all the donations you make to the sites, including the box you are donating to our HR “Mirror, Mirror” Challenge. In honour of your wonderful support, Martin and I are giving you your very own “trophy banner”.